He Listened To A Waitress’s Private Conversation. Then Wrote This On The Bill. I’m Speechless! After being served an eviction notice, one waitress thought she might lose her family’s apartment. Praying for a miracle, she continued to go to work to pay the bills and was shocked to find one man had given her a $3,000 tip on a bill for $43.50 last week! It’s wonderful to see how a random act of kindness can completely change a person’s life forever — like this waitress who got a car from one of her favorite customers. 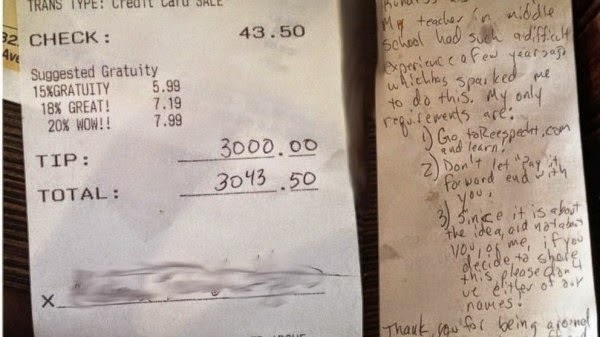 As a part of this middle-school teacher's pay it forward movement, a man left his waitress a $3,000 tip, asking her to pay it forward. Please SHARE this heartwarming story with all your family and friends on Facebook.